Che, this Vietnamese gelatinous, tapioca-filled, coconut milk dessert is rather hard to describe for the uninitiated. Is it a pudding? Dessert soup? It can be eaten warm or iced. It serves as dessert or a light snack. 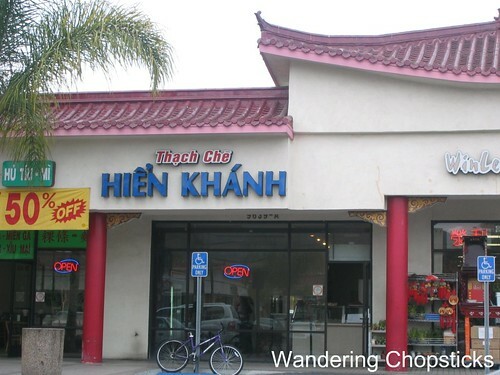 No matter what you call it or when you eat it, Thach Che Hien Khanh is the place to go in Little Saigon for the best and largest selection of che. Thach Che Hien Khanh started as a small cafeteria-line style eatery (it's too small to really call it a restaurant) at 9784 Westminster Avenue in a tiny strip mall with only a few other shops. The lines used to go out the door and the cars overfilled the parking lot. Back then, two people were needed -- one person to fight through the hordes to grab some che, a second person to wait in the car because there was no parking available. Thankfully, Thach Che Hien Khanh opened another location inside the Today Plaza on Bolsa Avenue in the heart of Little Saigon. This location, in the same strip mall as the always popular Quan Hy Vietnamese Restaurant and Banh Cuon Tay Ho 4, is convenient as a quick stop after eating at either of the two restaurants. But again, it's just a little eatery. There are no tables or chairs. Or menus for that matter. Grab drinks or flan or yogurt from the refrigerators first if you want them. Then line up and point to what you want. All their che offerings are on large metal trays behind glass. 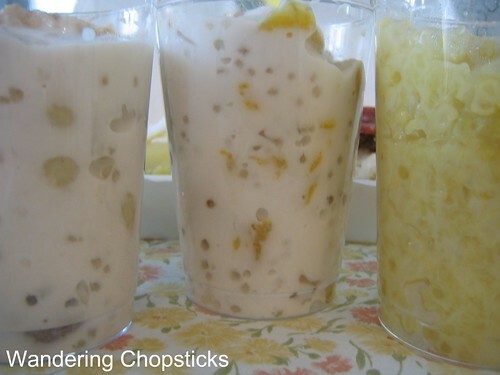 The milky che are variations of taro, banana, plantains, corn, with coconut milk and tapioca pearls with a sprinkling of sesame seeds and crushed peanuts on top. Che sam bo luong is a "healthier" offering with seaweed, lotus seeds, and dates. Che troi nuoc, small dough balls in ginger syrup, with or without mung bean filling. Che ba mau, three color che, usually features red bean, green doughy strips, and white bean or mung bean. Che Thai features lychees and jackfruit. Sticky rice with lap xuong (Chinese sausage). On this particular afternoon, I opted for xoi nep than (charcoal rice), black sticky rice with mung bean and coconut shavings. Coconut milk is served on the side. The sticky rice is studded with large slices of lap xuong and shredded chicken and scallions. 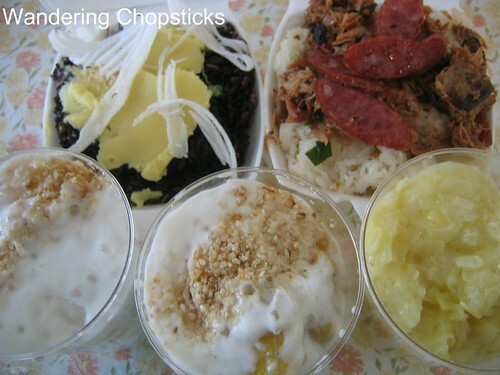 The banana che (starting from the far left) featured bananas, mashed taro, along with tapioca pearls, tapioca strips, coconut, and a light dusting of sesame seeds and crushed peanuts on top. The plantain che held their shape better than regular bananas. And corn che is mixed with sticky rice, coconut milk is served on the side. 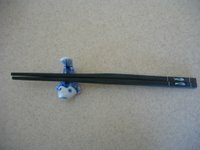 Each item is $1.75. I've never been charged more than that for anything, but, just in case, I hesitate to say everything is that price. Che should be eaten right away for freshness. Or refrigerated for later. And in the quirky hodgepodge of cultures and cuisines that we call Southern California. The kitchen workers are Latino and Spanish music can often be heard from the back, while Vietnamese workers are in front. And adapting to the Taiwanese craze for boba that's gone mainstream, you can also add that to your che too. Just ask. Same goes for ice. Otherwise, che is served at room temperature. This post is also reprinted with my permission on OC Food Blogs. If I took you around Little Saigon and for che, then it was definitely here. Did you bother to read the post? Click on the links? I linked to and blogged about the original location in Garden Grove. I don't live in LA/CA. So, I always try to stop by che Hien Khanh for deserts every time I visit Orange County. I love their banana cake(?) or banh chuoi nuoc dua. The banana cake is good too. My fave is the che bap though.